Trust your team to finish the project and HP RDX to keep it safe once they do. Great for Single-server businesses across many industries looking for a simple, fast, smart and reliable data backup solution. 320 GB, 500 GB, 1 TB or 2 TB capacity cartridges – for every size of server or workstation. Backup data at super fast hard drive speeds via USB 3.0 up to 360 GB/hour (uncompressed data)*. Broad compatibility with a wide range of servers and operating systems. HP RDX includes Windows backup mode, compatible with Windows Server 2012, for full integration with the tools of that operating system. Cartridges interchangeable in any HP RDX backup and archive system. Simply buy any qualifying HP RDX backup and archive system with cartridge and test it within your business. If you're not 100% convinced of the benefits, return the product to HP - within 90 days - for a full refund. Register your HP RDX backup and archive system and cartridge. Registration of the new HP RDX backup and archive system and cartridge is required in order to participate and must be done within 21 days of the purchase. Purchases and invoices dated prior to, or after this timeframe will not be eligible for this promotion. 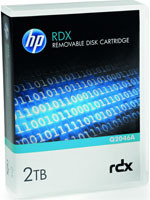 Only (1) HP RDX backup and archive system with cartridge can be registered and returned per customer. Return if you are not completely satisfied. Refer to your registration email and click on the link inside for a no hassle return. Apply to return the product within 90 calendar days after purchase date (not after registration date). You must ship the product back in the original packaging.